The 2018 holiday shopping season is expected to account for more than one fourth of annual US retail sales, according to Deloitte's 33rd annual Holiday Survey. The study also found that the Internet remains the lead shopping destination (and continues to grow), with 57 percent of sales expected to occur through online channels. All generations, except seniors, prefer online formats to physical store formats. Online retailers are expected to be the top shopping destination for middle and high income levels, and number 2 for low income shoppers. Mobile usage for the holiday season is continuing to increase, while other traditional digital platforms (desktop, laptop, tablet, social media) are plateauing in usage. 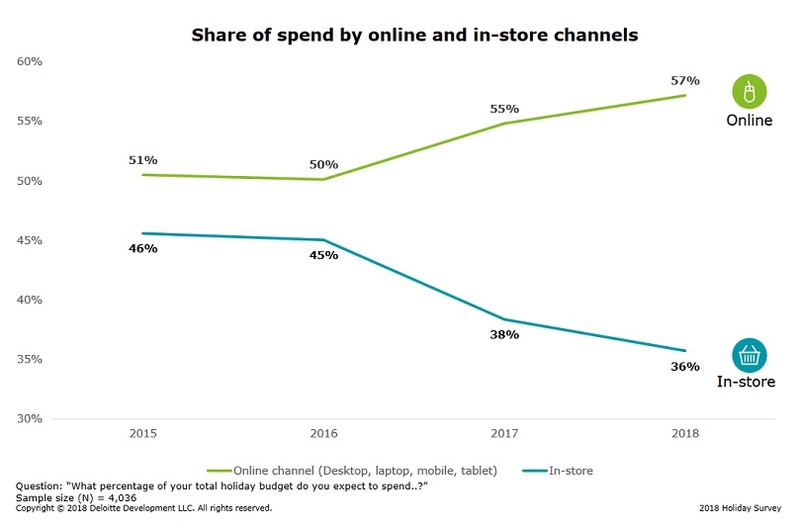 While desktop/laptop is the most preferred device for holiday shopping, mobile has seen the largest increase over the last year, which means that mobile usage will likely be driving digital growth overall. Almost one quarter (23 percent) of holiday shoppers plan to use social media sites to assist with holiday shopping. The 2018 holiday season will likely see an integration between online and in-store formats — 2 out of 3 shoppers (66 percent) plan to engage integrated experiences across digital and physical channels. Meanwhile, 54 percent plan to research in-store and purchase online, and 45 percent plan to buy online and pick up in-store. Only 19 percent of shoppers plan to use newer technology like seamless checkout, voice-assisted shopping, and VR/AR to assist with holiday shopping. 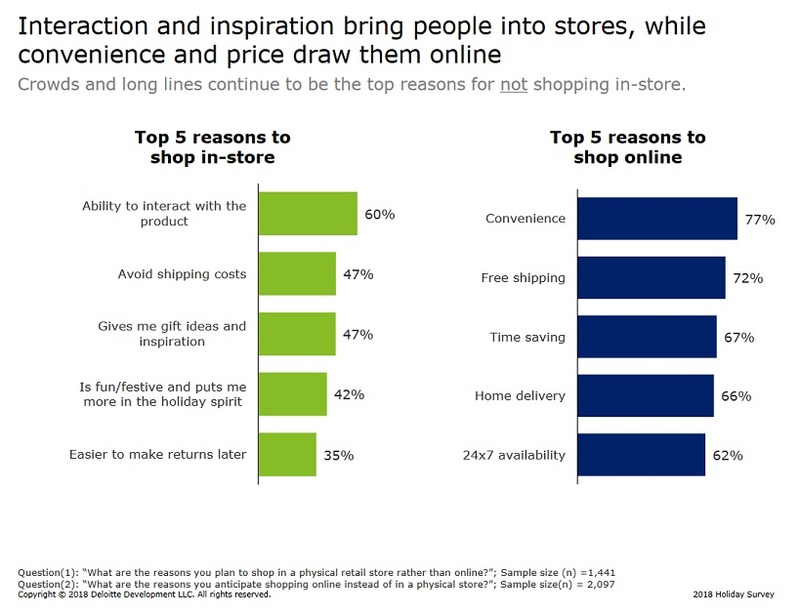 Consumers plan to turn to online retailers (66 percent), retail stores (56 percent), and search engines (56 percent) for their shopping research and inspiration. The chart below shows that 3 of the top 5 reasons for shopping online — convenience, time-saving and 24x7 availability — are all dependent on maintaining high application and website performance. Survey Methodology: This survey was commissioned by Deloitte and conducted online by an independent research company from Sept. 6-13, 2018. It polled a national sample of 4,036 consumers and has a margin of error for the entire sample of plus or minus 1 to 2 percentage points. 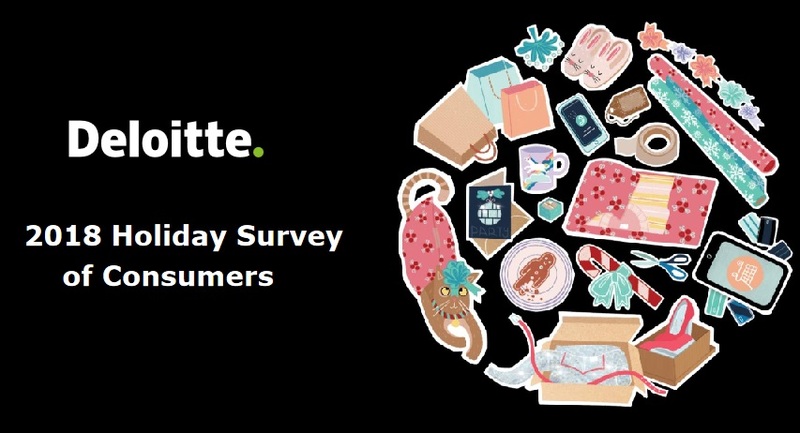 Download Deloitte's 33rd Annual "Holiday Survey"